When Anneka Bading was swimming at a popular waterfall, she didn’t realise there was a tragedy unfolding behind her. 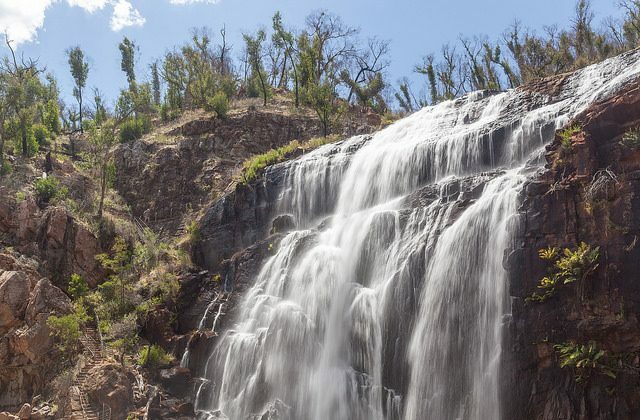 Bading, 24, used a GoPro to film herself and her friends at the MacKenzie Falls in Grampians National Park on Saturday, Jan. 20—but she had unwittingly captured the final moments of a man’s life in the background of her footage. The man, thought to be a 28-year-old Taiwanese national, had slipped into the water and drowned while his friends frantically tried to save him. Bading was swimming with her two friends near the waterfall at around 5 p.m. that day when she started hearing people screaming and pointing where the water was very deep. “At that point we had no idea what was going on. We thought some sort of animal was in the water. We couldn’t understand what was going on and they kept screaming and pointing,” she told The Stawell Times. “One girl grabbed my GoPro stick and tried to use it to save him. I then clicked someone was drowning,” she said. Bading said she tried to call triple zero, but no one in the area had phone reception. “Everyone didn’t know what to do and we couldn’t understand [the victim’s friends]. My legs were shaking when I knew what was going on but no one knew what to do,” she told the newspaper. She said an off-duty lifeguard who was at the falls jumped in but found it too deep and the pressure too intense, so he didn’t risk going in. “We all told him not to risk it. Thank god he didn’t,” she said. The 24-year-old drove for 10 minutes until she got reception, and managed to speak to the emergency services. They told her that there was a rock shelf under the water beneath the falls that could have trapped the man. The man’s body was found about 9:30 a.m. on Sunday, The Age reported. Bading is now calling for more signage and better mobile phone reception in the area. In a statement sent to The Age, Parks Victoria Chief Operating Officer Simon Talbot said they were “terribly saddened” by the incident. “In all of the state’s national parks and reserves it’s important for visitors to observe warning signs and the advice of park rangers,” he added. Talbolt told The Stalwell Times that there were three signs at the falls prohibiting swimming, and that Telstra was exploring options to extend coverage in the waterfall’s car park.